A Big Thank You And Looking Ahead MidSouthCon Schedule: Updated! You may or may not have noticed, but there’s something new here on the website. 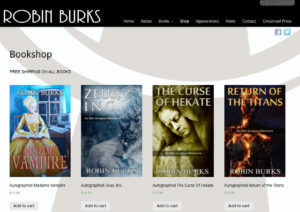 In case you missed it, there’s a shiny new “Shop” link at the top of the page. So what does that mean? It means that you can now buy autographed paperback copies of any of my books and have them shipped directly to your home! Even better is that all orders come with free shipping. With the holidays right around the corner, books make great gifts. So consider gifting yourself or someone you love (or even just like) with an autographed copy of one of my books.